In a programming language, compiler plays a crucial role in execution of a program. Compiler is a language component which converts a source code, written using one of the interactive programming languages, into machine code, which the server can interpret and act upon. As a refresher, Oracle compilation technique took a wide turn in 11g release with the induction of real native compilation. The C compiler has been replaced with the native one, thus justifying the ‘real native compilation technique’. Oracle has inducted few keywords in its glossary which behave as a clue to the compiler. These keywords are named as Pragma(s), which are read by the compiler to be decisive over the method used for the compilation of current program unit. 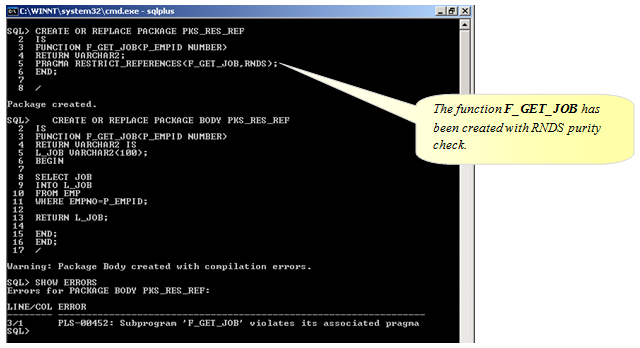 Note that the method of compilation of a program unit manipulates its run-time behavior. Being the part of source code, the pragma statement tips the compiler to differently compile the program unit, thus manipulating the behavior of the program unit, currently under compilation. Note that the pragma is interpreted only at the time of compilation and not at the time of execution. Until Oracle 11g, PL/SQL programming language could make use of five types of pragma(s) which are listed as below. AUTONOMOUS_TRANSACTION – Compiler allows schema objects like subprograms, PL/SQL blocks, or triggers to commit their transaction within their scope. RESTRICT_REFERENCES – Allows the compiler to scan the database purity during package compilation. It can be used in packages only. EXCEPTION_INIT – Compiler associates a user defined exception name with an exception number. SERIALLY_REUSABLE – Compiler deduces the package state from session level to just a server call. It can be used in Package spec only. PRAGMA INLINE – New member of oracle pragma family. It is used to explicitly inline a program unit. Oracle 8i release 1 saw the introduction of a new language feature, which allowed having simultaneous active transactions in the same database session. The autonomous pragma allows a separate active transaction, which is independent of the main transaction in the session. The COMMIT/ROLLBACK done within the autonomous object does not affect the main transaction and vice versa. All in all, it is an individual transaction and not the part of main transaction. Within a database schema, a standalone or nested subprogram, a trigger, an anonymous PL/SQL block, object type member method or packaged subprogram can be declared as autonomous. Often, users refer autonomous transaction as nested transaction, which is wrong. It would be completely mislead the philosophy behind the autonomous transactions. Vocally, there is nothing called nested transactions in database. There is only one main running transaction in a session, which contains all DML statements issued in the session. Single TCL command (commit/rollback) feeds the changes permanently into the database. Autonomous transactions are the voluntary ones which are activated within the main transaction, but share no relationship with it. For better understanding purpose, autonomous transactions are executed in a separate temporary session created by the database server. The main transaction remains in passive or suspended state until the autonomous transaction is active. As soon as the autonomous transaction is completed, the main transaction resumes the action. Suppose I have to implement error tracing mechanism in an application. The mechanism should trace all the exceptions raised in the application along with its host object details. The mechanism must handle the exception propagation situations and rolling back situations. I create a procedure P_TRACK_ERROR as below. I capture and insert the required information into a table and mark this operation as autonomous transaction. In this way, I segregate the transaction performed in this procedure, from the main transaction. Therefore, even if the raised exception causes rollback to the current ongoing transaction, P_TRACK_ERROR would successfully capture the exception details. Let’s take a look at the above procedure to record the errors. The pragma was introduced to control and preserve the database state. It worked as a watchdog for the packaged function so that they should not modify the package or database state. It restricted the creation of the package, if its member function violated the specified purity level. While the Pragma must use minimum one restricted state in its specification, it may contain all the four too. Let’s take a look at the usage of pragma and impact of purity level in the below snapshot illustrations. A package function F_CHANGE_LOC is created in the package PKS_REF_REF with WNPS level check. This implies that it cannot modify the package variable L_LOC. Impact: Package PKS_RES_REF is created with compilation errors. The function is created in RNDS purity check. The function would not allow the querying of database tables within its declare section or executable body section. The function F_UPD_SAL is created in RNDS purity level specification. The function would not allow the DML operations on the database table within its body. The pragma EXCEPTION INIT allows the association of a self chosen error number with a user defined exception. The error number can be any of the system recognized error number. The procedure P_GET_ORDERS has been created to get the order code and order quantity for a given date. If no order booking has been made, procedure must display appropriate message. The pragma SERIALLY_REUSABLE enables the package state initialization for each and every server call. As per the conventional behavior of the packages, their state is initialized only during the first time they are referenced in a session. This state remains persistent for the complete session and is flushed off only at the termination of the session. With the use of the pragma SERIALLY_REUSABLE, the package state is persistent only for a sever call. It gets initialized with every call made to the server while invoking any of its member construct. The package PKG_TEST_PRAGMA demonstrates non persistent package state at every server call. Inlining is an effective feature to gain performance benefits in a procedural and structural code. During compilation, oracle tends to replace the inline subprogram call with its definition itself. The INLINE pragma is a latest induction in the family. It is used to manually inlining a subprogram when the optimizer level is set as 2. It has to be specified once, just before the subprogram call. The inlining effect would remain persistent for all the subsequent calls to the subprogram; unless and until the NO pragma is specified for the subprogram. For quick reference, PLSQL_OPTIMIZE_LEVEL parameter specifies the optimization level of the subprogram. • If it is 0, then the optimizer follows ‘NO inlining’ principle. • For the value of 1, the optimizer follows intermediate inlining like working with iterative constants. • For optimizer level 2, the optimizer takes the path of ‘Intelligent inlining’ i.e. it would inline the subprogram by virtue of its intelligence. This is the appropriate and default level for the optimizer and provides scalability to manually inline the subprograms using PRAGMA INLINE. • At optimizer level 3, optimizer is forced to inline all possible subprograms at high priority, which is not commendable from developer’s perspective. For demonstration purpose, the session has been altered to set PLSQL_OPTIMIZE_LEVEL at 2. Now, for example, I have to calculate sum of factorial series in the format as 1! + 2! + 3! +…+N! I create a procedure P_CALC_SERIES and define a local function FACTORIAL to get the factorial of a number. I would inline the local function call using PRAGMA INLINE as shown below.